The Chilton's ATV Handbook is a must-have guide for ATV owners and riders. Hundreds of bandw photos show you how to service, maintain and repair your All Terrain Vehicle. Volumes of material have been written on the best way to go about purchasing a house or car. But much less is available to someone who is shopping for an ATV, which could be one of the next most expensive purchases you might make. If you shop for a car or truck, there are many questions you must ask yourself, such as "How will I use this vehicle" and "How much money do I have to spend?" These are valid questions, which also must be asked when you are looking at ATVs. The popularity of ATVs has grown tremendously and manufactures have begun producing ATVs for specific purposes. This increases your option, and will allow you to find an ATV that suits your specific needs. Nothing is more frustrating than shelling out your hard-earned money for an ATV, and finding out it is not even close to what you wanted. Hopefully, this book will help you avoid this problem by discussing you options as a potential ATV owner. Also, aftermarket manufacturers have products available to further customize your ATVs to suit your needs. With such a large aftermarket of parts and accessories, most people end up customizing their ATV is some form or another, whether it's for looks or for comfort or function. The diversity of today's ATVs have allowed them to become more specialized, allowing superior performance for the designed use. The numerous features and options that each manufacturer includes can be of great benefit to you. Usually, you'll have to make a compromise somewhere on a potential ATV to get the features that you desire. Try to look ahead to the future when making these decisions. Will your ATV be the one that you wanted a couple of years from now? Is the overall design and/ or features of your ATV going to benefit you, or leave you disappointed with its performance? Ask yourself as many questions as you can possibly stand, and then consider all the possibilities. Weigh out your options very carefully. You might have to look around a little more than you want to, but you'll be glad to have the ATV of your dreams when everything is over. Otherwise, you may spend all of our hard earned money on an ATV that some salesman convinced you to buy, and find out later that it's not even close to what you wanted. NEVER let someone tell you what YOU want or need. Gather as much information as possible about an ATV that interests you, so you can make an educated decision and decide if it's really the ATV that you really want. One of the biggest concerns when replacing an exhaust system is how much effect it is going to have on the tuning of the engine. Simply bolting a muffler to your ATV is not all with which you have to concern yourself. Replacement exhaust systems from the aftermarket or performance arm of the manufacturer will typically have higher rates of flow than the stock systems. This helps performance if your engine is tuned to take advantage of it. If you don't tune the engine and adjust the mixture, chances are that you will cause the engine to run lean. A lean running engine will run hot and eventually damage itself. Low restrictions pipes equal higher flow of gases through the engine. Higher flow of gases means you need more air coming into the engine. More air means more fuel that the engine can burn. The end result is that you have to rejet your carburetor to make things right. 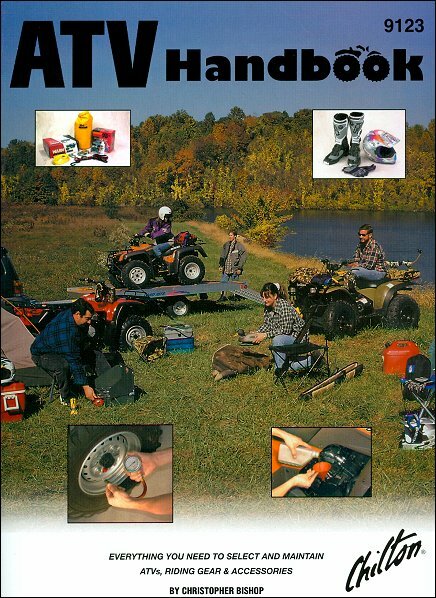 Ask a question about Chilton's ATV Handbook: A Buyer's and Owner's Manual.